Design the perfect space for relaxation and entertaining with Polytek’s innovative floor finishes. Mankato is a beautiful place to live. During the winters you can enjoy watching the snow fall from the comfort of your living room while during the summers it is warm enough to eat outdoors and spend time with your friends and family on your patio or deck. Because you are probably spending a lot of your spring, summer and even fall months outside, you want to be sure your patio is up to par. A chipped, cracked or damaged patio is not only going to decrease the value of your property but it can also prevent you from entertaining or spending time outside. 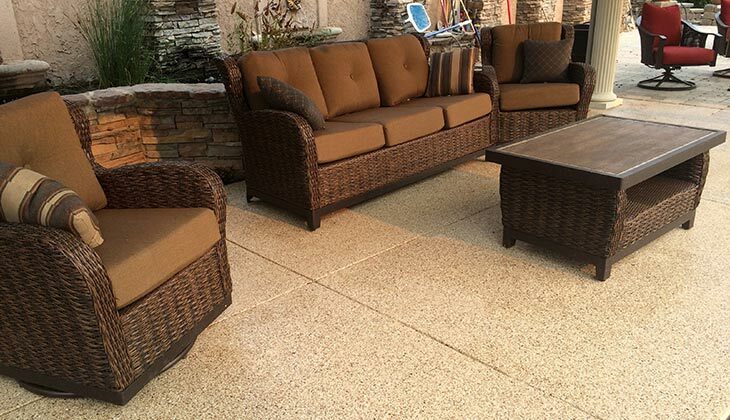 Revive your patio area and take back your outdoor living space with our various flooring application solutions from Polytek Surface Coatings. Polytek Surface Coatings have been helping homeowners in Mankato with their patio surface applications for several years. We are a locally owned and operated company with the knowledge, experience and reliability that you should expect from a contractor. We offer a wide range of materials suitable for this important outdoor space. An older patio can look damaged after a few hard years. However, when you choose a Polytek Surface Coatings patio application, this is not the case. All of our residential concrete coatings come with a 15 year warranty from things like chipping, cracking, peeling and excessive wear. One application can make a world of difference to the look of your patio, even if it is getting on in years. Perhaps you are just building your dream patio and looking for the right application to perfect your look and protect this important space. When you have people constantly walking back and forth you want to be sure that your patio surface is smooth and scratch free. This is especially the case if you have pets, children or if you plan on placing heavy furniture, such as tables, chairs and even a barbeque outside. Some patios may even hold a hot tub or swimming pool and thus you want to be sure the flooring application is up to the heavy task ahead. When it comes to your patio, you want to be sure you are choosing the right application and the right color to handle the everyday pressures and harsh weather conditions. At Polytek Surface Coatings, we can help. Contact us today for a free estimate by calling (507) 380-7655.